1. Take a half or full piece of matzo and top it with your favorite cream cheese spread. 2. Layer the smoked salmon to your desired amount. 3. Arrange a few slices of the red onion. 4. 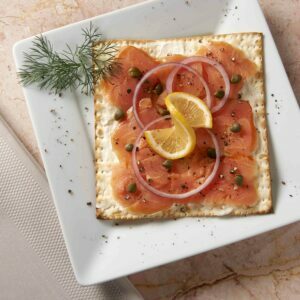 Drizzle the capers on top of the matzo and crack fresh pepper from a mill on top. Decorate with a few sprigs of dill.